The best atmosphere for a business to run is in a market space where supply is equal to demand. If the position shifts to either side, it will lead into a biased market condition where either the producer or the consumer will have an advantage over his counterpart. If demand exceeds supply, the producer dictates terms and if the supply exceeds demand, the ‘bargaining power of the consumer’ increases manifold. This is the exact scenario of the markets globally. The supply is greater than the demand. Hence the consumers expect to get a wee bit extra for what they actually pay for. This makes the producers trying to cut down their costs in order to provide the consumers with what they want. All this is happening as every producer is eyeing the same market space. Take a group of 100 people. If 4 producers try to sell their toothpaste to the 100 customers, in a win-win situation, each producer gets only 25% of the market share. Due to this, there is a fierce competition amongst the producers to outrun each other in the race for profits. This cut-throat, bloody competition, is called the Red Ocean Strategy. 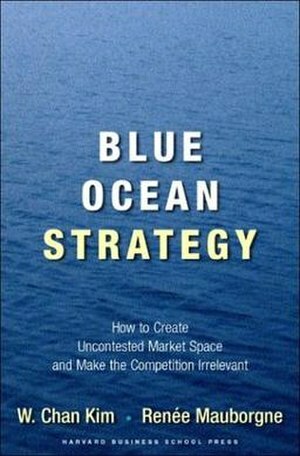 Blue Ocean Strategy (BOS), like the name suggests, negates all the competition in the market. It does so by capturing the uncontested market space. For example, a car manufacturer tries to make his cars appeal to the people between 30-45 years of age as the likelihood of a person to buy a car is high in that group. But making the cars trendier, powerful, sporty, will appeal to the people between 20-30 yrs. The desire in people within this age group to buy a car is much higher. Thus, tagging the car at a higher price, even if he sells lesser cars, the company would still flourish. There is a need for innovation for a BOS to be viable. Small innovations in manufacturing process or distribution process would not serve the purpose. A new market space is created only if the product that the company sells is much different from the product that others sell. And this difference comes only through innovation. BOS not only deals with formulating a strategical plan, but also brings into it, execution of this strategy in the target market. Due to these characters of the BOS and the advantages it has, majority of the companies are trying to incorporate the Blue Ocean Strategies into their system and most of them already have their success stories. All thanks to W.Chan Kim and Renee Mauborgne for postulating BOS.